The spring air is full of rich earthy scents, especially over our swamps. Often leading the wetland aromas is the skunk cabbage. Many know but few admire this big, fetid fellow. Yet, it is one of our most fascinating wildflowers, finely tuned by evolution to deal with a harsh time of year. As it rises in late winter and early spring, the plant burns carbs – just like exercising humans – heating up and melting the frozen earth around it. Once up and blooming, the flower head – protected by a reddish-brown hood – can be as warm as 70 degrees when the air outside is 30. The hood’s hue serves a second purpose: It’s the color of carrion. Flies are the first insects of the new season. Searching for the thawing carcasses of winter-killed creatures, they are drawn to the color and the smell, thinking the cabbage is a corpse. 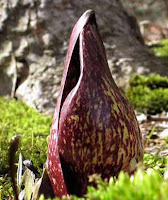 The plant’s warmth is a plus, encouraging the flies to roam about the ball of flowers, unwittingly picking up pollen to carry to the next mouth-watering skunk cabbage down the line. The tricks may stink, but they work.